Northwest Bornean orangutan (Pongo pygmaeus pygmaeus). 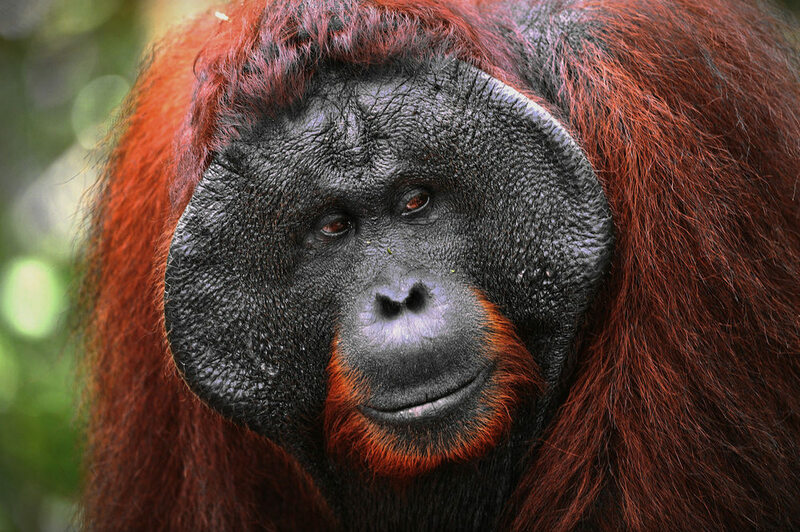 Central Bornean orangutan (Pongo pygmaeus wurmbii). Northeast Bornean orangutan (Pongo pygmaeus morio). Orangutans live only in Asia. The Bornean orangutans are only found on the Island of Borneo in the Malaysian forests of Sabah and Sarawak and in the Indonesian forests of Kalimantan. Sumatran orangutans are only found on the Indonesian island of Sumatra. Orangutans belong to the Hominidae family that includes humans, chimpanzees, bonobos and gorillas. Orangutans split from the human branch of the Hominidae family about 15 million years ago and are our closest evolutionary relatives after chimpanzees, bonobos and gorillas. Orangutans reside in tropical rainforests and are the most arboreal of the great apes in that they rarely venture down from the trees. Instead, they prefer to live and move through the forest canopy. Like all great apes they build sleeping nests out of branches. More than half of the orangutans’ diet is fruit. They also eat leaves, tree bark, and other vegetation. Occasionally they will also eat small invertebrates, honey and birds' eggs. Orangutans have been observed using tools when foraging for food. Sumatran orangutans, for instance, use sticks to extract seeds from the large neesia fruit. Orangutans appear to be the most solitary species of great apes. Although they live in groups, and adult females have close bonds with their infants, mature males often keep their distance from other group members. Orangutans are the only great ape species with two types of mature adult males. One type, the flanged male, develops secondary sexual physical traits. These include a large flanged disc-shaped face, a long flowing coat of hair and a large throat sac that allows the male to make deep vocal calls over long distances. The flanged male becomes very intolerant of other males and grows in stature to be around twice the size of a female. The second type of male does not develop secondary sexual characteristic and is similar in size to an adult female. Unflanged males are unable to make long calls and are much more tolerant of other males. Both types of male will successfully reproduce with females. All males have the potential to develop secondary sexual characteristics but it is still unclear why the development is suppressed in some males. Females usually have their first baby when they are 15 years of age. Pregnancy lasts around 8 months. The newborn is totally dependent on the mother and clings to her underbelly. After about 6 months the infant will travel around on the mother's back and will live with the mother for 6-7 years. Adult female orangutans have long intervals between births that can last 6-8 years.